The Clarke Historical Library recently participated in the 4th Annual GrandparentsU program which is offered by Central Michigan University’s Alumni Association. 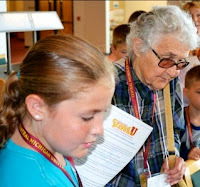 GrandparentsU is a summer camp that brings grandparents and their grandkids together for three days of fun on the campus of CMU. This experience includes hands-on educational sessions conducted by faculty members along with other fun activities for the grandparents and children ages 8 to 12. This year there were 132 participants including 64 adults and 68 children. Participants eat and sleep in the residence halls, attend special classes throughout the campus and experience many highlights of the campus during GrandparentsU. This year GrandparentsU took place June 22-24, 2011. The Clarke Library hosted two separate events. On Thursday June 23, the Clarke was one of the clues in a Scavenger Hunt called “Not Quite 39 Clues” and the children were asked to locate the Smallest Book in the World located in the Clarke Library. On Friday June 24th the Clarke hosted “Reading, Riting, and Rithmatic in the 1850’s”. The children looked at McGuffey Readers, (old school books) and made craft projects including Thaumatropes (also known as "turning wonders"). The Clarke Library staff was delighted to be able to participate in such a fun and educational event. We don’t know who was having more fun, the Grandparents, or the children! 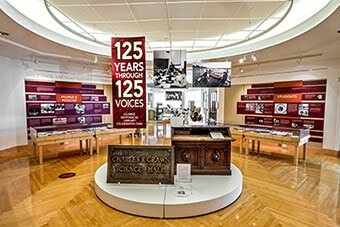 The Clarke Library has a rich collection of books and manuscripts related to the history of the Old Northwest, and you will find in that collection many rare first editions that were published before Michigan became a state in 1837, when it was still considered a northern territory. Michigan Territory at the time included all of Wisconsin and half of Minnesota. We make an effort to add to our collection in this area of history whenever we can, though it is hard to find published primary sources—i.e., published letters, journals, and firsthand accounts—that we don’t already own. Besides primary sources, we also watch for and collect current secondary sources published on the Old Northwest, such as Alan Taylor’s recent The Civil War of 1812. 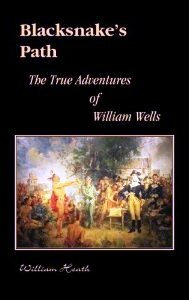 This spring we ordered for the library a novel entitled Blacksnakes’s Path: The True Adventures of William Wells. 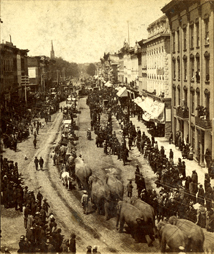 Wells is familiar to anyone with an interest in the early history of the Old Northwest. The Miami Indians, who took thirteen year old Wells captive in 1784 and raised him, named him Blacksnake. Wells, or Blacksnake, married the daughter of Little Turtle and fought against the American armies sent into Ohio in the early 1790s. He later switched sides, joining with the Americans and serving as a scout for General “Mad” Anthony Wayne. He was with Wayne at the Battle of Fallen Timbers, and he acted as an interpreter at the Treaty of Greenville in 1795, which brought the Indian wars in Ohio to a close. It is not our practice to purchase historical fiction, but this thoroughly researched book is different. It is history written as fiction by a very capable historian, William Heath, and it brings together in a coherent narrative events of the period that are often treated disparately. The section “Afterword and Notes” provides an excellent starting point for readers with a burgeoning interest in this period of history. The book should appeal to anyone who enjoys imaginative writing that is grounded in, and remains true to, the historical record. 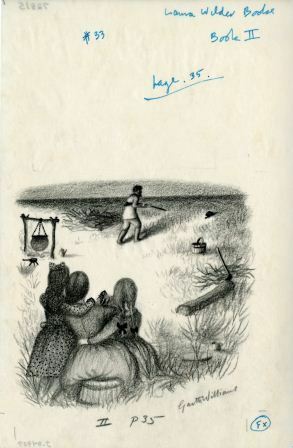 At a recent auction the Clarke Library was fortunate to obtain two original drawings created by Garth Williams for the 1953 reprinting of Little House on the Prairie. 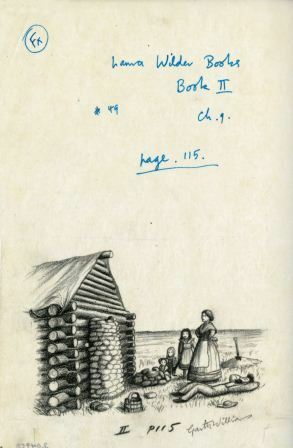 The Little House books are among America’s most recognized children’s volumes. The series was first published between 1932 and 1943. In the late 1940s Harper, which published the books, decided to reissue the volumes with new illustrations. To undertake the job Harper hired Garth Williams. He was no stranger inside of Harper’s office. Ursula Nordstrom, Harper’s chief editor of children’s books, had recruited him in 1945 as an illustrator. A few days after recruiting Williams, Nordstrom received a note from E. B. White, attached to his latest project, Stuart Little, suggesting she hire Williams to illustrate the volume. In 1951 Williams illustrated White’s second children’s book, Charlotte’s Web. Nordstrom knew who she wanted to create the new illustrations for Laura Ingalls Wilder’s popular series, but Williams was concerned about his ability to do the job well. 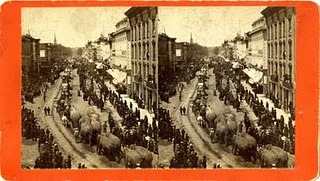 Williams had never ventured west of New York’s Hudson River. The vast stretches of land described by Laura Ingalls Wilder in her books were as alien to him as the face of the moon. To resolve the problem, Williams made an extensive western trip, visiting the land on which the book’s characters played out their stories. Much of the resulting art was drawn in Italy. Regardless of where the art was created or the background of the artist, the results justified Nordstrom’s choice of Williams. His simple pencil drawings captured the spirit of the book and have become an integral part of many children’s lives. Williams died in 1996 and beginning in 2010 his estate began to auction the many drawings he had retained. The Library’s purchase of the two illustrations was made possible by the Francis and Mary Lois Molson Endowment, created by the Molson’s to help the Library obtain important original works drawn to illustrate children’s books, and the Friends of the Libraries.